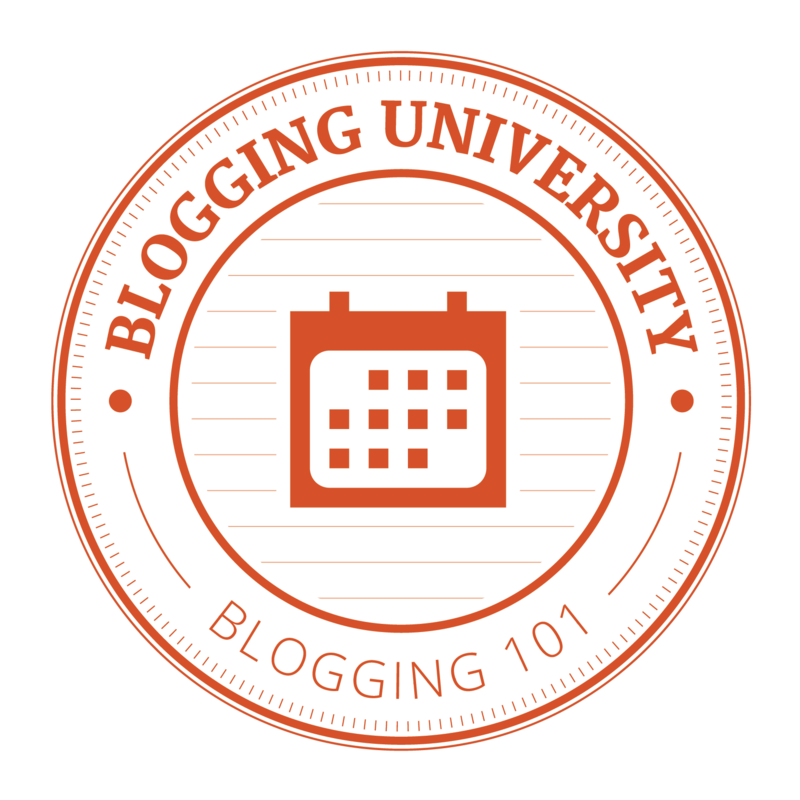 The AWM Pitching to Publishers Course started on Monday 4th May. I had some trouble logging in but after a couple of emails and a phone call I was finally able to access the course today and complete last week’s two activities. The first one was an icebreaker activity where we had to answer a few questions about ourselves. Hi! My name is Rachel and last night we went out for a lovely mother’s day dinner at a Thai restaurant. I was born in Rockhampton, central Queensland. I would recommend the book,“Little Bee” by Chris Cleave. This book tells the compelling story of two courageous women who have suffered considerable hardships. I read it on the Christmas holidays and couldn’t put it down. For the second activity we had to write an elevator pitch. An “elevator pitch” is the description you might give someone who asks about your novel, that is short enough to deliver in an elevator ride. Due to the short time frame, your pitch needs to give a concise yet enticing sense of what your manuscript is about. “The Curse of the Shattered Sceptre” is an action-packed story full of magic, mystery and adventure for 9-12 year olds. After accidentally unleashing a torrent of curses from an ancient book of spells, Ollie and his book club buddies, Jasper, Jed, Liam and Eli must work together and use their wits and imagination to unravel a series of twisted clues. In a race against time and with many obstacles in their way, the boys must face their deepest fears to find the missing shards of coloured glass belonging to the book of spells. Once the book’s shattered sceptre is mended, the balance of nature will be restored. However, if the boys fail, they will be cursed forever! 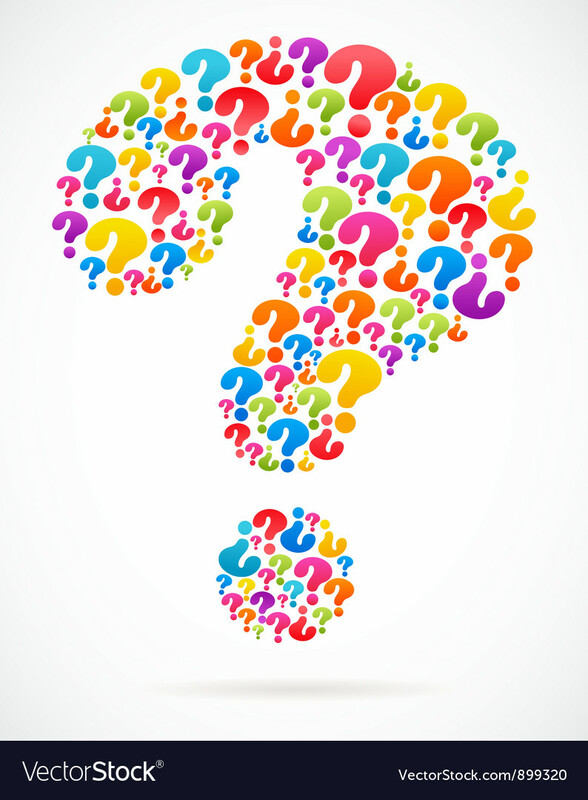 I’m wondering if it’s too short – not enough information? Or are the sentences too long?? I’d really appreciate some feedback as it seems that, apart from the tutor, there is only one other person doing the course! Thanks to Millie Thom for nominating me for the Blog Tour Award. Check out her blog as she is a fantastic writer and participates in a lot of writing events which I enjoy reading – Friday Fictioneers, Flash Fiction for Aspiring Writers, Word of the Week (WOW) and Mondays Finish the Story. This award involves answering four questions about writing. Give them the rules and a specific Monday to post by. My nominees can post on Monday 27 April. At the moment I am still working on my junior fiction chapter book that I started about 3 years ago. I first wrote the story as a 1000 word children’s story for a writing competition but then decided I wanted to turn into a chapter book. It’s now over 7000 words and I’m up to my 9th draft. However, I still have a couple of more chapters to add to it before I then read it again and again, no doubt changing and adding more adventures along the way. My goal was to complete it and have it ready to send in to an agent by the end of June 2015 (before I go back to work) but I’ve been a bit obsessed with blogging and writing flash fiction lately that I haven’t even looked at it! Doesn’t matter. Every bit of writing is good practise and I will just aim to have it finished by the end of the year instead. I am also working on a number of children’s picture book manuscripts – some to enter in competitions and some to send off to publishers. My children’s chapter book is about a group of boys who love books and reading. They are on a mission to find the best book ever written. However, after finding an ancient book of spells and accidentally unleashing a torrent of spells, the five friends set off on an adventure through the fun fair. They must work together and use their wits and imagination to find clues and solve riddles in order to banish the curse. The story is for all kids but I wrote it with the idea of encouraging boys to read. I’m hoping that they will enjoy reading about all the magical adventures and fun that these boys have. I love writing stories for children. Picture books only have a small amount of words and you really have to make them count. I like the challenge of trying to show, not tell, letting the illustrations tell a lot of the story. I started writing stories just for fun to read to my children. I enjoyed it so much that I decided that I wanted to learn all the ins and outs of writing a children’s picture book so I got an editor to look at some of my stories, I googled lots of information, I went to a number of writing conferences and I continued writing stories every spare minute I had. When I sent my first story off for a manuscript assessment, the editor said, “You have interesting ideas and your stories have potential… What lets you down is your writing.” Her words encouraged me to improve. I also found entering competitions very useful as the feedback is incredibly helpful. * Jot down the main story line (beginning, middle and end) and the characters. * Make a story web with the problem in the middle and the solutions/adventures branching out from it. * I have a sheet for each character with their name, appearance, strengths, weaknesses, quirks, fears, desires etc. * I write chapter by chapter, editing bits and pieces as I go, but also going back after a few chapters to add or rearrange. * I have a notebook ready to write down any funny sayings or things that I might see or read about that I think would be good to add into my story. * Once the whole story is finished I will read over it again and again and again – probably proofreading forever! * Over the years I have been trying to win a mentorship program whereby a professional would work with me to get my story up to a publishable standard. This year I would also like to have a go at applying for a grant to have an editor assess my work. Thank you to Dawn M. Miller for this week’s photo. This post is a response to the Flash Fiction for Aspiring Writers (8th April), hosted by Priceless Joy of Beautiful Words. This day, on their twentieth wedding anniversary she felt not an ounce of love for him. Over the years, the fire that had fueled their exciting and passionate love affair had slowly burned out, leaving nothing but resentment. As the wind chimes sang their mournful melody, Jessica tiptoed onto the verandah and gently brushed her husband’s shoulder. Absorbed in his own bleak emptiness, Steven reluctantly turned towards her and lightly kissed her cheek. Without the glint of a smile, he muttered, “Thanks,” and returned to his position by the railing. Across the road, James looked up from his newspaper and waved. Jessica waved back. From where she stood, the grass was definitely greener on the other side. Themes: colour and creativity, feeling loved, writing letters, expressing yourself, equality. Opening Lines: One day in class, Duncan went to take out his crayons and found a stack of letters with his name on them. Synopsis (blurb from inside jacket): Poor Duncan just wants to do some colouring. But when he opens the box of crayons, all he finds are letters, each saying the same thing: we quit. Beige is tired of playing second fiddle to Brown. Blue needs a break from colouring all that water, while Pink just wants to be used. Green has no complaints but Orange and Yellow aren’t talking to each other. What is Duncan to do? What I like about the book: This story is colourful and humorous. Each crayon has written a letter to express how they feel: tired, worn out, second best, empty, not used enough, happy. In the end Duncan uses all the crayons to create a beautiful piece of artwork. 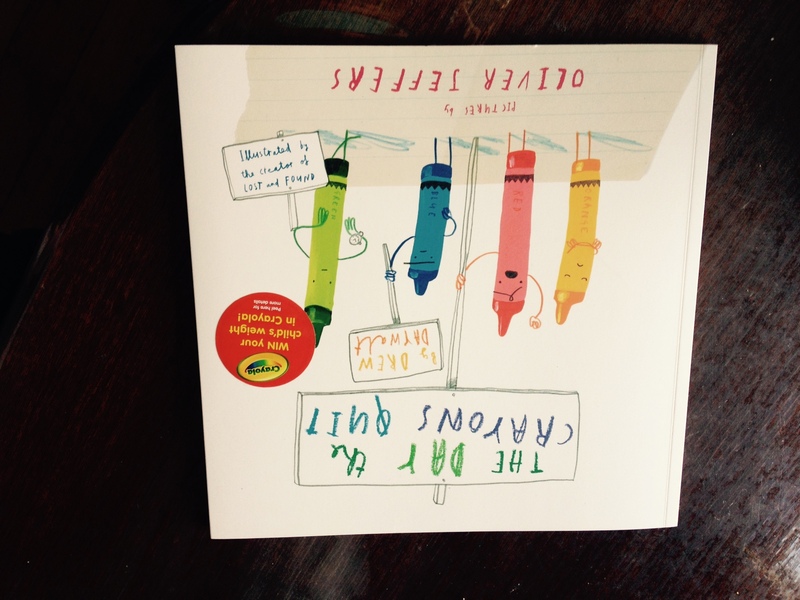 I love Oliver Jeffers’ illustrations, made to look like a child has drawn them. Resources: Lots of fun activities can be found here. * Pretend to be one of the crayons in your pencil case and write a letter to yourself expressing their thoughts and feelings. * Write a letter to a friend or family member telling them your favourite colour and why. * Create a colourful piece of artwork using all the crayons in the box. Visit Susan Leonard Hill’s blog to see all the other Perfect Picture Books. Friday Fictioneers is a flash fiction challenge to write a story of no more than 100 words relating to the photo prompt kindly provided by the host, Rochelle Wisoff-Fields. Click on the link above to join in or read more flash fiction. Warning: It’s addictive! Here is this week’s photo prompt, copyright David Stewart . . .
Lily leaned against the Jacaranda tree and breathed in the sweet air. When the band began to play she closed her eyes and as the haunting melody caressed her ears she gently swayed to and fro, reminiscing of her time on stage; the lights, the audience, the adrenalin rush as fingers and bow entwined, frantically sweeping backwards and forwards, faster and faster across the strings. Lily screamed, her voice echoing in the surrounding darkness. Clutching her disfigured hand she huddled beneath the tree, sobbing; for lost dreams and shattered hopes. This is my third week participating in the Flash Fiction for Aspiring Writers challenge. Thanks to Priceless Joy for organising the challenge and to Vanessa Rodriguez for the photo prompt. What to do: Write a 100-150 word story (give or take 25 words) relating to the photo prompt. If you’d like to join in, click here for guidelines and information, and to read more Flash Fiction. As the sun was setting, Gemma stepped out of her apartment into the chilly autumn breeze. Her high-heels grated against the sidewalk, breaking the silence of the deserted street. She pulled out her compact mirror and applied another layer of lipstick as she walked. Gemma stopped and looked around. Were the ghostly shadows and street lights playing tricks on her eyes or had her car vanished? She couldn’t remember where she’d parked it. Tiny shoots of panic were beginning to sprout. Behind her lights flashed and a car unlocked. Gemma whirled around and spotted her beloved BMW on the other side of the street. Confused, she crossed the road. Footsteps followed. She fastened her pace, and so too did the footsteps. With heart pounding in her chest, Gemma hid in a doorway, hands trembling as she fumbled around in the deep abyss of her handbag. Where are they? A figure appeared in front of her. She opened her mouth to scream but nothing came out. Standing in the cold, a young woman closes her eyes and looks up. A pleasant glow of light warms her face, absorbing some of the chill in her bones. Hugging herself, she remembers music and laughter filling the house with happiness, presents piled high on a table and guests dancing. So many precious memories, so little time. Bending down, she carefully arranges the daffodils; her mother’s favourite. She turns, eyes beginning to well. One single tear gracefully slides down her cheek. Check out all the other Friday Fictioneers here. Friday Fictioneers is a challenge to write a 100 word story from a picture prompt hosted by Rochelle Wisoff-Fields. Last Friday I chose “The Children who Loved Books“. Today I’ve chosen “Dog Loves Books”. Themes: bookshops, reading, creativity, imagination, sharing books. 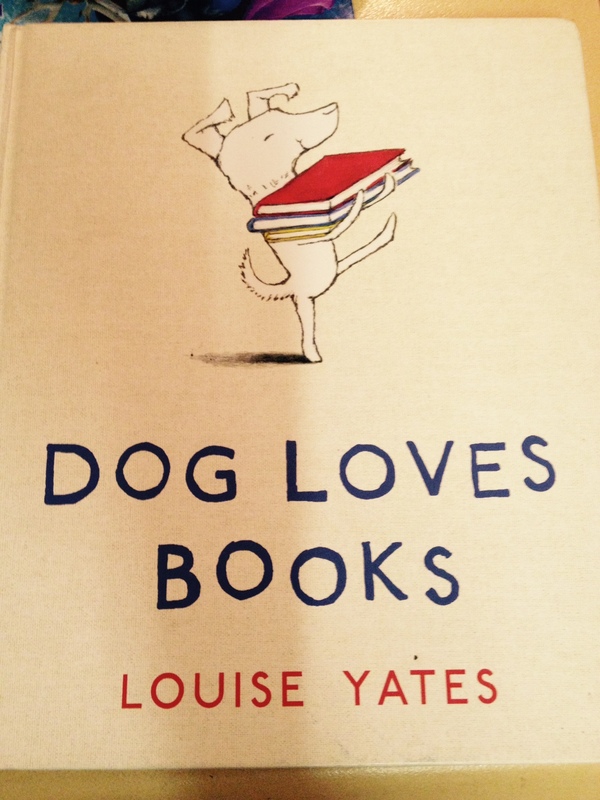 Opening Lines: Dog loved books. He loved the smell of them, and he loved the feel of them. He loved everything about them. Synopsis (blurb from back of the book): Dog loves books about dinosaurs, and Dog loves books about aliens: in fact Dog loves all books! Dog has his very own bookshop, although he doesn’t have many customers. But that’s all right, because when Dog is surrounded by books, he is never short of friends or fun. 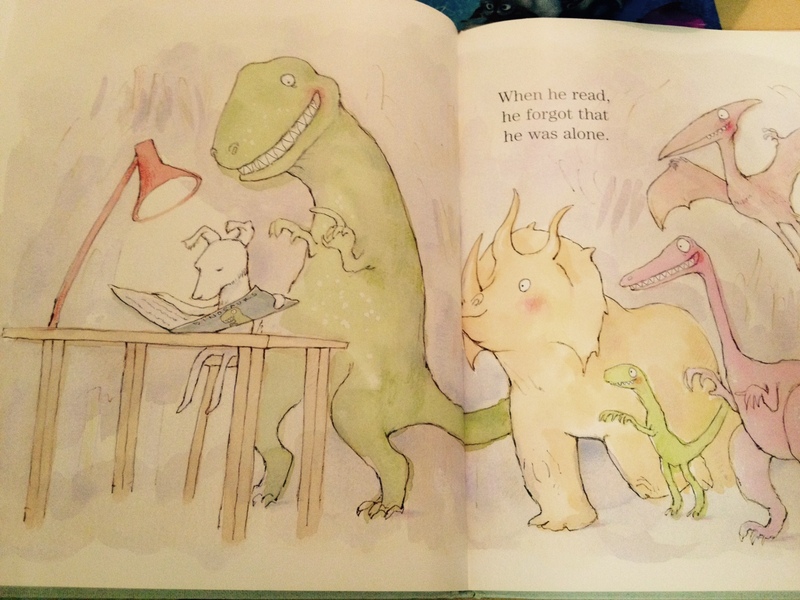 What I like about the book: This story also celebrates books and encourages reading. While reading, Dog forgets where he is and gets caught up in the adventures of the story. I also like the water-colour illustrations. Resources: Activities for parents and teachers can be found here. Flash Fiction for Aspiring Writers – 18 March 2015. Here is the haunting photo that inspired my latest flash fiction. Thanks to pixabay.com for the photo. Pete and Danny raced up the driveway of number 9, Hollingsworth Drive and hid in the bushes. The decrepit mansion loomed overhead, chilling them to the bone. “I’m going inside,” replied Danny. “Kids have gone missing.” Pete grabbed his friend’s arm. Two large hands grabbed Danny by the shoulders and hauled him inside. Pete slammed both hands over his mouth, stifling the scream that was trying to erupt from deep within. Whimpering, he looked around, wondering what to do. He crept around to the closest window and peered inside. Pete turned away from the window but not before catching a glimpse of the old man’s grotesque face; rotting skin and eyeballs dangling from his eye-sockets. To join in the fun or read more flash fiction inspired by this spooky photo go to Flash Fiction for Aspiring Writers. 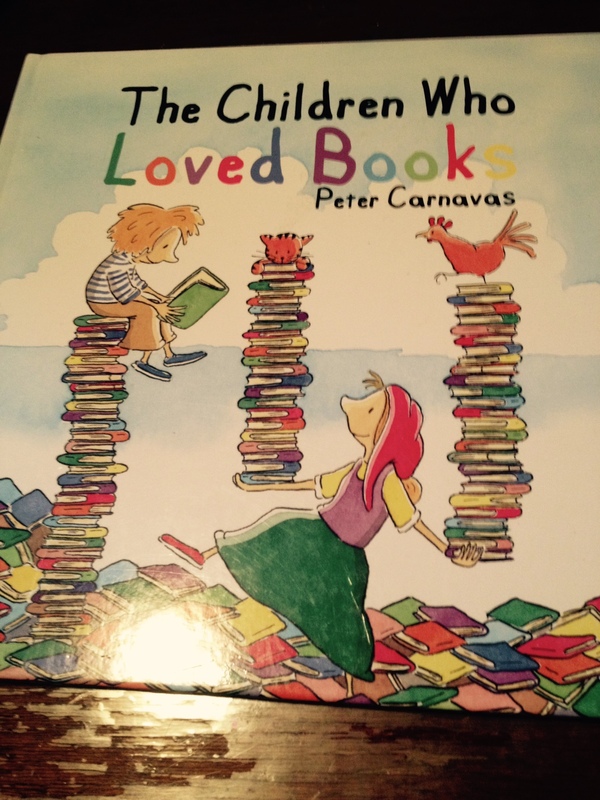 Peter Carnavas is one of my favourite Australian authors. I have been lucky enough to meet him twice: I went to his book launch for “The Boy on the Page” and I also attended one of his writing sessions at the Children’s and Young Adult Writers And Illustrators Conference last year in Brisbane. Opening Lines: Angus and Lucy didn’t have very much. They didn’t have a television. They didn’t have a car. Synopsis (blurb from back of the book): Angus and Lucy love books. They have hundreds of them. Then one day, all the books are taken away, and Angus and Lucy discover they need books more than they ever imagined. They didn’t even have a house. 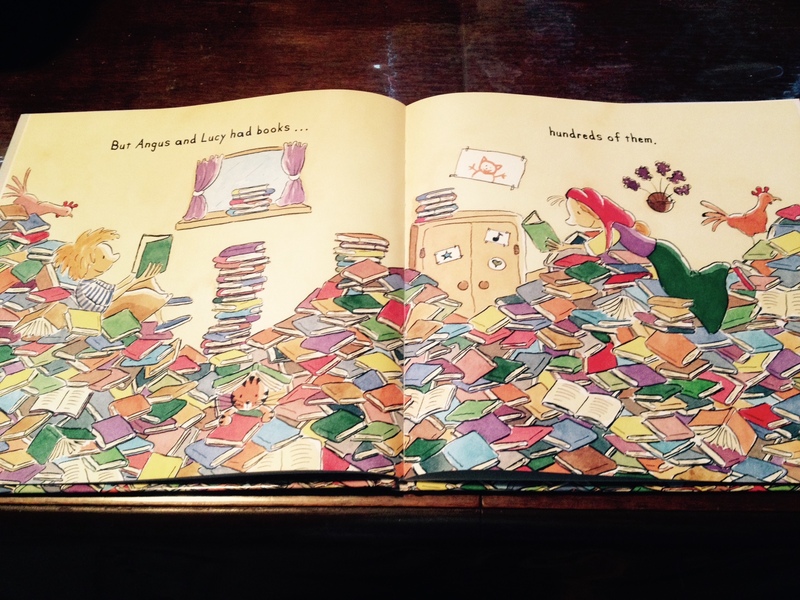 But Angus and Lucy had books… hundreds of them. 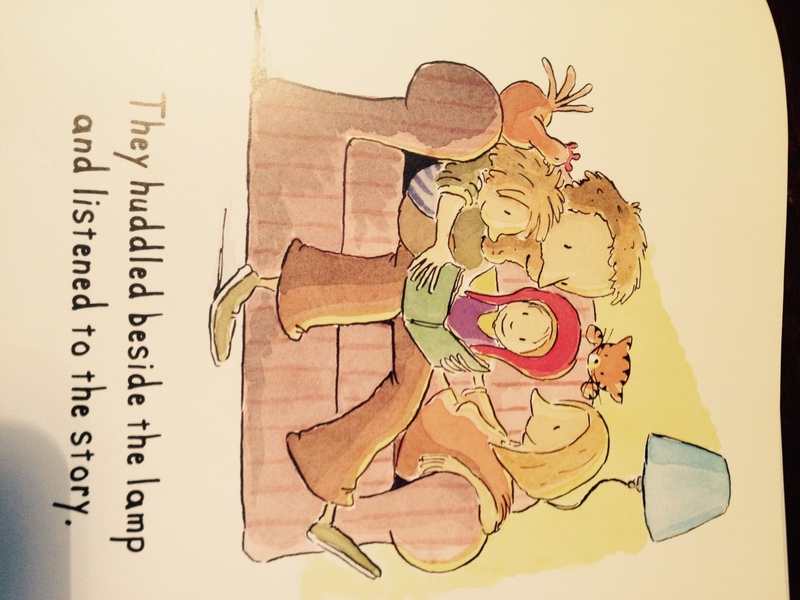 What I like about the book: This story celebrates books and reading and shows how books can bring people and families together. You don’t need televisions and fancy cars. As long as you’ve got each other and a book to share, then life is good! The story is warm and moving, like most of Peter Carnavas’ books. 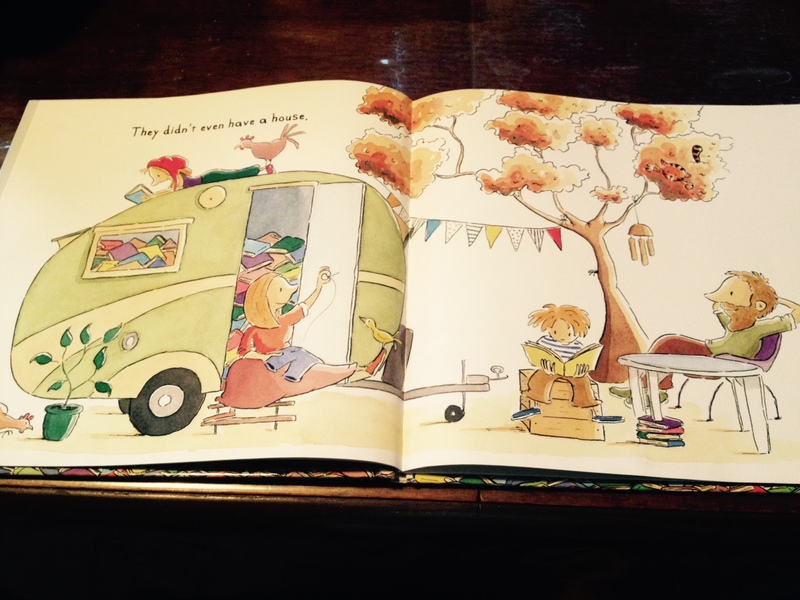 I also love his illustrations; the bright colours and lovable characters. Discovering hobbies and minimalism. Loving life and tea. Caring for animals. Another life journey with lots of English biscuits to nibble along the way.